One of the interesting things about preppy fashion is that so many items are perfectly appropriate for male and female preps. Both men and women love needlepoint belts, polo shirts, and the quintessential preppy shoe, the penny loafer. For as long as I can remember, there has been at least one pair of penny loafers in my closet. I loved them as a child, teenager, college student, sorority girl, and they’re still among my favorites. Penny loafers naturally suit any outfit, any season, and any activity. What a perfect all-purpose shoe! I don't like socks with penny loafers. The only time I wore socks with penny loafers was when they were part of a school uniform. But even then, I scrunched down the green uniform knee socks, until I was scolded and asked to pull them up to the knee. 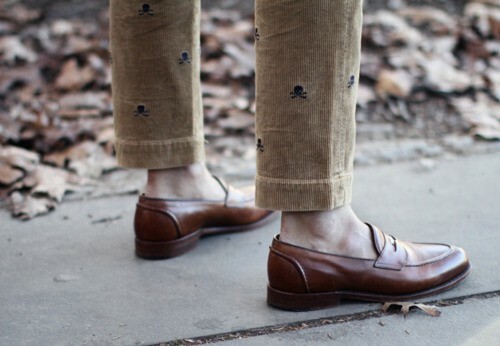 Penny loafers without socks are timeless. Preppy corduroy pants with an embroidered critter or motif look fantastic with penny loafers, don’t you think? Basic penny loafers have not changed much in style or shape over the past few decades. Grace Kelly’s simple, yet elegant shirt and jeans are a perfect match for penny loafers. This scene composed in 2011 is still very contemporary with a very similar outfit. This season, I’ve found a fun update on the penny loafer that I think you will love. Tory Burch introduced their updated twist on this classic shoe for fall. I love the penny loafer from Tory Burch in red. It will be a perfect match to all of the “pink tomato” aka red color in the Lilly Pulitzer fall collection. What do you think? Do you have penny loafers in your closet? I love Penny Loafers!!! Great post! I love penny loafers. I recently saw an adorable pair of Coach ones! Thanks for reminding me how fabulous the penny loafer is. Great, classic looks. Love the TB loafers, Brad Goreski blogged about those (so obsessed with the Rachel Zoe Project! ), where did you find the photograph of the critter cords? Are they Rugby? It's so hard to find critter cords these days, I'm still holding onto my J.Crew ones! I love penny loafers! Leave it to Tory to take them and make them more gorgeous than I could ever imagine! I only have ever owned one pair. I had to be like my grandfather. Ever since he died it makes me think to much of him to own a pair.